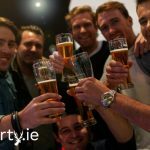 We have a great value package lined up in Dingle for your Stag Party! With everything all within walking distance it is ideal spot for a brilliant stag night out! Firstly, accommodation is very city centre, which is spot on as no taxi’s will be required! for the afternoon. Because we know you don’t want to miss any of the sporting action. Brewing Company: Tour around Dingle Brewing Company and you even get a pint after! Very popular activity in Dingle with Stags! Fungi Tours: Meet the famous Fungi!! This is something you definitely don’t want to miss! Archery: Learn all the skills of an archer for the afternoon! Bay/Harbour Cruise: Enjoy a chartered cruise around Dingle Bay and Harbour. Well worth the trip to relax before the big night! Angling Trip: Go fishing for the day with the Lads! Best way for a bit of bonding! the lads and will lead to some great conversation in the pub afterwards. Stand up Paddle Boat: For something a bit different on the water, this is a must to try! Windsurfing: Take to the waves with this activity! No experience necessary for this! Windsurfing & Paddleboarding: Can’t decide which to pick so why not try both! describe this activity! So much craic to be had! Booze Bus Cruise: See the best pubs in Dingle with this activity! Because let’s be honest you’ll be going on a Pub crawl anyway. Dodgeball: Great competitive fun game of dodgeball. Aim of the game is to hit the apposing team with the ball. The team with a last man standing wins! Why not stop off at Ballyhass Lakes Adventure Centre, near Mallow, on the way to your Stag? – So give archery, kayaking, abseiling, raftbuilding, Gladiator games and more a go. Try Cable Wakeboarding at Ballyhass Lakes, near Mallow, on route to your Stag do…Unreal! We have arranged food in one of Dingle’s best pubs where you can eat your fill after your afternoon activity! Also you’ll need to refuel for the stag night ahead. After your munch, we have organised a round of shots in a bar for your group. There is plenty of craic and madness to be found here! So when your ready to throw shapes on the dancefloor we have a VIP entry into one of Dingle’s most popular clubs! You also get another free round of shots here! Because we know how to look after our stag parties. This is a great value package and from only €69 per person! Finally, contact us today for more information!